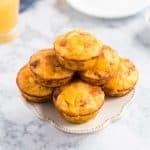 Bacon and Cheese Egg Muffins are a fast, easy breakfast recipe perfect for meals on the go and freezer friendly too! Make a batch and always have a high protein snack ready to go! Spray a muffin pan liberally with nonstick spray. In a medium bowl combine eggs and milk and whisk until blended. Stir bacon and cheese into the egg mixture. Use a ladle to fill each muffin cup. Bake 25 minutes or until centers are set. Eat immediately or allow to cool then store in refrigerator up to 4 days or freeze.